Although research has shown resistance training has a multitude of health benefits and reduces risk of overuse injury in athletes by about 50%, many runners skip the weight room in favor of putting in more kilometres. Here are some of the most popular myths about strength training for runners. Are they keeping you out of the weight room or from gaining the most benefit from your current resistance training sessions? A common misconception is that resistance training will result in weight gain, resulting in a decrease in running performance. However, total body mass does not increase when resistance training is added to an endurance running program. Further, improved running economy (the amount of oxygen consumed at a given pace), and faster running performances are observed in runners who add resistance training to their training routines. For instance, 6 weeks of heavy weight training (2x per week, 4 sets of 4 reps, using a weight that corresponds to 80% 1-repetition max, for exercises such as lunges and heel raises) improved 5-km race times by nearly 4% in moderately trained runners. In contrast, no changes were observed in a control group of runners who only participated in endurance running. While heavy strength training results in improvements in endurance running performance, the same effects have not been observed with light, circuit-type resistance training (3 sets of 40-45 seconds of continuous repetitions of lower limb exercises). Furthermore, desirable tendon qualities, such as tendon stiffness, improve the best with slow, heavy resistance training. In contrast, low-weight, high-repetition resistance training has minimal effect on tendon stiffness. The time a muscle is under tension, with adequate rest between sets (2-3 minutes), seems to be important factor in eliciting beneficial adaptations in a runner’s musculoskeletal system. Runners should complete a preparatory phase of 2-4 weeks with 2-4 sets of 15 repetitions per exercise with lighter weights prior to beginning a heavy resistance program. While the gluteal muscles are important for running, the calf and the thigh muscles are actually more responsible for supporting our bodies during running. In fact, the calf musculature contributes about 50% of the torque that supports our body during endurance-paced running. Interestingly, our ability to push off with our calf muscles declines about 31% between 20 and 60 years of age. The decline in calf muscle performance is a major contributor to a shorter step length (shuffling pattern) during running that is commonly observed in older runners. Therefore, a comprehensive resistance program should target the calf, thigh and hip muscles, with the calf musculature requiring extra attention in the masters runner. There is also some suggestion that maintaining running volume and running intensity as we age can help reduce the age-related decline in ankle push-off during running. Excessive hip adduction (the thigh collapses inward towards the runner’s midline) is often observed in some runners. Excessive hip adduction is associated with certain knee injuries, such as patellofemoral pain and iliotibial pain. Specific hip muscles, called the gluteal muscles, control hip adduction. However, there is no evidence that strengthening the gluteal muscles will reduce hip adduction during running. In fact, there is little evidence that weak gluteal muscles are even associated with hip adduction during running. Studies suggest that highly structured programsthat retrain a runners gait can reduce hip adduction, but these programs focus on improving the coordination of the hip during the actual task of running. It may be tempting to mimic the movement patterns of running in the weight room by doing multi-joint, “functional” exercises. But, “good mechanics” practiced during resistance training exercises do not seem to transfer to running (see myth 4 above). In fact, single-joint exercises may be preferable to attain running-relevant levels of muscle forces. For instance, a single leg squat is a great strengthening exercise for the hip and thigh muscles. However, a squat minimally loads the calf muscles and requires far less ankle range of motion than what is typical during running. In contrast, a single leg heel raise isolates the calf musculature and enables the runner to move the ankle through a full range of motion. The Achilles tendon, which transmits muscle forces from the calf musculature to the heel, can experience forces as high as 6-8x a runner’s body weight during running. 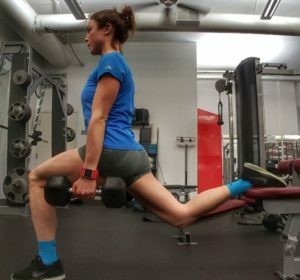 Therefore, a runner’s resistance training program should consist of a mix of multi- and single-joint exercises to ensure that their muscles and tendons are loaded adequately. Almonroeder, T., J. D. Willson and T. W. Kernozek (2013). “The effect of foot strike pattern on achilles tendon load during running.” Ann Biomed Eng 41(8): 1758-1766. Bohm, S., F. Mersmann and A. Arampatzis (2015). “Human tendon adaptation in response to mechanical loading: a systematic review and meta-analysis of exercise intervention studies on healthy adults.” Sports medicine-open 1(1): 7. Devita, P., R. E. Fellin, J. F. Seay, E. Ip, N. Stavro and S. P. Messier (2016). “The Relationships between Age and Running Biomechanics.” Med Sci Sports Exerc 48(1): 98-106. Ferber, R., B. Noehren, J. Hamill and I. S. Davis (2010). “Competitive female runners with a history of iliotibial band syndrome demonstrate atypical hip and knee kinematics.” J Orthop Sports Phys Ther 40(2): 52-58. Hamner, S. R., A. Seth and S. L. Delp (2010). “Muscle contributions to propulsion and support during running.” Journal of biomechanics 43(14): 2709-2716. Karsten, B., L. Stevens, M. Colpus, E. Larumbe-Zabala and F. Naclerio (2016). “The Effects of a Sport-Specific Maximal Strength and Conditioning Training on Critical Velocity, Anaerobic Running Distance, and 5-km Race Performance.” Int J Sports Physiol Perform 11(1): 80-85. Kulas, A. S., T. Hortobagyi and P. DeVita (2012). “Trunk position modulates anterior cruciate ligament forces and strains during a single-leg squat.” Clin Biomech (Bristol, Avon) 27(1): 16-21.